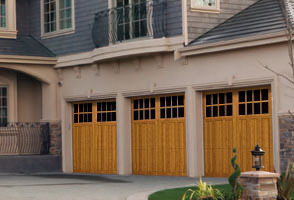 True, solid-wood carriage garage doors, are available. They can be made to swing out from the door jambs, or bi-fold up against the door jambs. They are available in beautiful Hemlock, Western Red Cedar and Mahogany for staining finishes, and there is a paint grade exterior also available for opaque finishing. Their engineering features finger jointed rail and stile construction for timeless appearance and durability. The photo at the left illustrates the stained wood appearance of carriage doors manufactured by Overhead Door from their Signature™ Carriage Doors 580P Series. These carriage doors radiate refined craftsmanship, unequaled quality, and pure elegance. The wood materials chosen for their assembly resist rot and insects, and will yield years of dependable operation and service. The 580P Series is available in a nearly unlimited number of wooden garage door styles, and custom styling can be arranged. They feature heavy-duty hardware with decorative options and are available in numerous window designs and glazing options. The 580P Series comes standard with polystyrene insulation bearing an R-value up to 4.75. These carriage doors exhibit handmade artistry in the finest Amish tradition. If you have wind loading requirements due to the building code criteria in your jurisdiction, the 580P Series can be fitted by the manufacturer to meet or exceed the criteria. They come with a one-year limited warranty from the manufacturer. Although true carriage doors are expensive, the value they add to your estate home is immeasurable, and surpasses the initial cost many times over. Nothing says "they look real" more convincingly than the real thing. If you are planning a large estate home, then consider carriage doors if your parking structure will be part of the street-scape. Lesser garage doors really won't do justice to the overall appearance of a truly well designed estate home.